If he has hairy forearms he might have a hairy back as well. Lots and lots and lots of pictures of George in shorts and no top over the years. Front and back he looks damn fine to me. Now if he'd just do an advert for Casamigos without his shirt on! Oh, and the other thing I like - as far as I can see NO TATTOOS. Right LorneDoone. Don't think he has any tats. But you can still see on his left ear where he had it pierced years ago. Saw on an earlier Instagram post that Rande and Cindy were sitting to George's left at the awards. They must have been there as his guests since neither of them is in the business. Rande is very good at marketing his Casamigos. Good picture of George's award above. 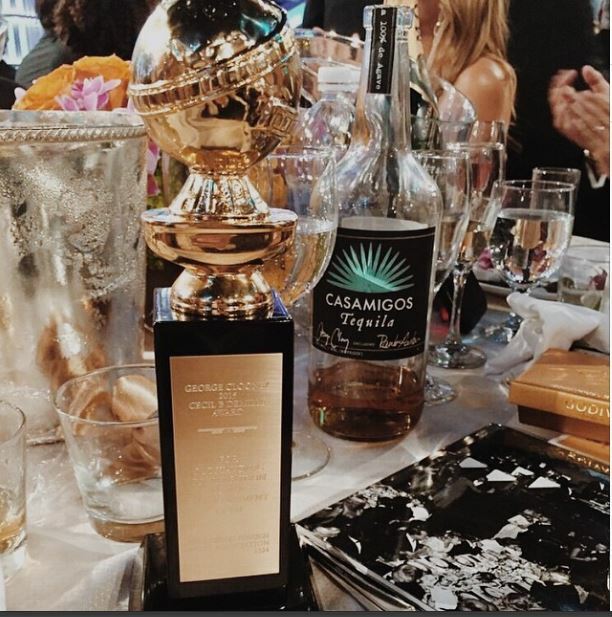 So, did the casamigos get drunk during the golden globes or did they bring an almost-empty bottle with them??? I'm sure that between Rande, Cindy and George, they polished that bottle off quite well. Amal has "tasted" Casamigos, and I don't know if the others that were at George's table drink it or even like it. Katiedot wrote: So, did the casamigos get drunk during the golden globes or did they bring an almost-empty bottle with them??? I'd imagine every visitor to the table had a shot ! Watching some of the post program interviews ( ie: Extra, etc), they were serving casamigo tequila ( least they were showing bottles). 20 minutes ago, EST during the TV program Squawk Box on CNBC Rande Gerber was interviewed about the Casamigos Tequila that apparently won the Gold Medal for 2014 as the best tasting tequila. Rande explained the 4 different kind of tequila (blanco, repressado, etc..) and working on a fifth one called extra dark or something like that; the difference on these products is represented by the time that they sit in the barrel. Rande said that it all started as three friends who vacationed in Mexico a lot and decided to create a tequila with great taste that would not need to be covered with salt or lime. No, they are not interested in selling the company, Rande is running it with the help of George and Mike (Meldman??) and it is "their creation" but is being distributed all over now. Rande has sold his own bar to his brother and is now running Casamigos full time. I am sure you can replay this episode of CNBC Squawk Box a little later. A good success story for George & Rande. Yay! Very happy for them. And the tequila is really good. Donnamarie wrote: Yay! Very happy for them. And the tequila is really good. Which one did you get ? get it here in UK ? I'm SO please that George's plan to buy into a Vegas joint went pear shape ! I drink the Reposado which is the one that's recommended if you want to drink it straight or on the rocks. It's really smooth. Easy going down. I usually make margaritas on the rocks with it. There is a Blanco tequila that's crisp and clean in taste and the newest addition is the Anejo which I think is a little richer in taste, a bit more complex. Think this one is aged the longest. I haven't tasted the blanco or Anejo. Not sure if it's such a good thing if one of your best friends is now all in on a business venture with you. Makes you a bit stuck. socimar wrote: 20 minutes ago, EST during the TV program Squawk Box on CNBC Rande Gerber was interviewed about the Casamigos Tequila that apparently won the Gold Medal for 2014 as the best tasting tequila. Rande explained the 4 different kind of tequila (blanco, repressado, etc..) and working on a fifth one called extra dark or something like that; the difference on these products is represented by the time that they sit in the barrel. Rande said that it all started as three friends who vacationed in Mexico a lot and decided to create a tequila with great taste that would not need to be covered with salt or lime. No, they are not interested in selling the company, Rande is running it with the help of George and Mike (Meldman??) and it is "their creation" but is being distributed all over now. Rande has sold his own bar to his brother and is now running Casamigos full time. Good news ! Congrats . I want to taste it . Thanks for your information Donnamarie. A bottle of Casamigos is on my bucket list ! LOL. George Clooney is finally launching his Tequila brand, Casamigos, in the UK this spring. 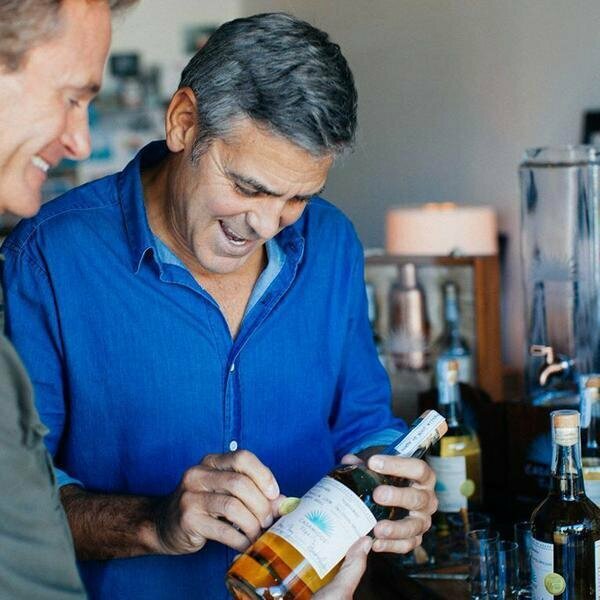 The brand, created by Clooney and business partner Rande Gerber in 2012, claims to have become the fastest-growing ultra-premium Tequila in the US. Already available across the US, Bahamas, Canada and Hong Kong, the brand will now become available in the UK in Blanco, Reposado and Añejo varieties. 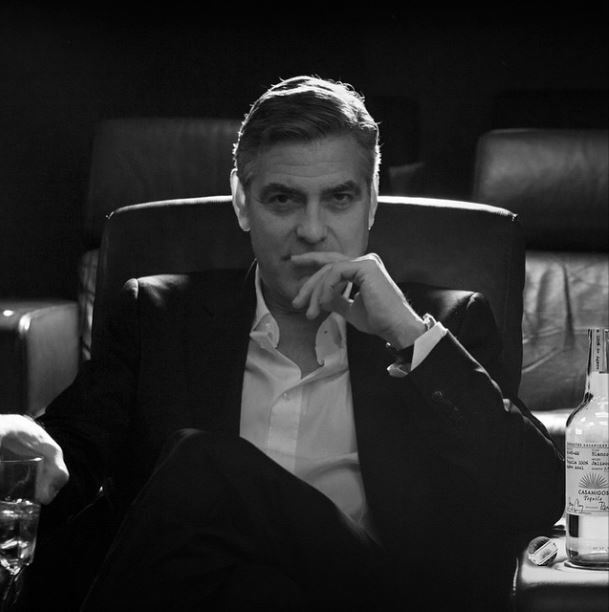 Clooney, who has appeard in films such as Gravity and The Monuments Men, said: “We love tequila. On the rocks, by the shot, at times, straight from the bottle. 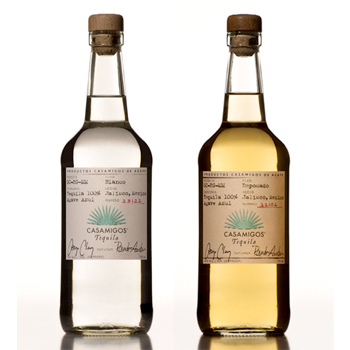 “We are excited to bring Casamigos to the UK. It’s a great feeling to share something we created, drink and are extremely proud of,” added Clooney and Gerber. The brand will be distributed through Cellar Trends in the UK. It will carry an RRP of £49.99 for the Blanco, £54.99 for the Reposado and £59.99 for the Añejo. Great news....Coming here at last ! Joanna - Just curious, but would you know how the prices for Casamigos compare with the prices of other tequilas in the UK? It's on the expensive side here - so much so that my local liquor stores won't carry it because they feel it won't sell due to the high price. LizzyNY wrote: Joanna - Just curious, but would you know how the prices for Casamigos compare with the prices of other tequilas in the UK? It's on the expensive side here - so much so that my local liquor stores won't carry it because they feel it won't sell due to the high price. I can check my local supermarket. Is Casamigos sold in litre size ? converted to $58.00 per litre. so that may be rough enough to clean copper !! Joanna I've never seen a litre size here in the US. It runs about $50-$55 here in the states. It's on the expensive side but there are some other brands that are even more expensive. they have it in stock.....So watch this space. 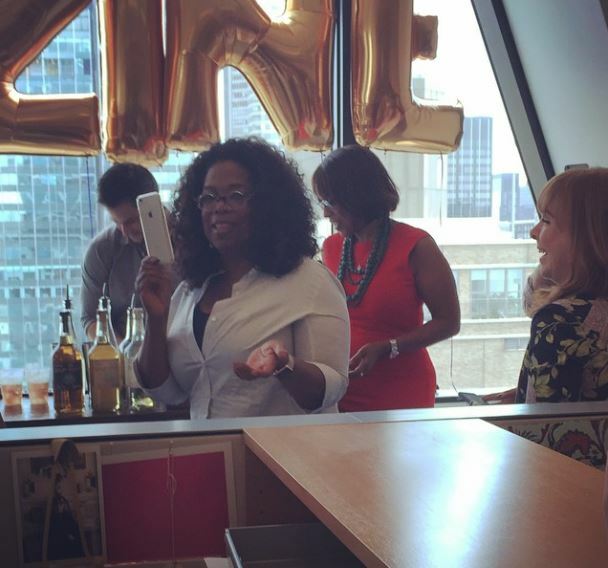 Oprah is celebrating with Casamigos. celebrate O Mag's very sweet 15th anniversary. Very cute couple . Love the picture . In this pic he looks like the other pics in the road trip thread. When I saw it I thought he was in a bar or restaurant and someone made a pic with him. But why is she posting: "When your boss insists on taking a picture with you"? Why would George be her boss? And what does it has to do with Casamigos? She hash taged Casamigos but what does it has to do with this pic? Not sure this is in the right thread. But it's news - or a new angle! 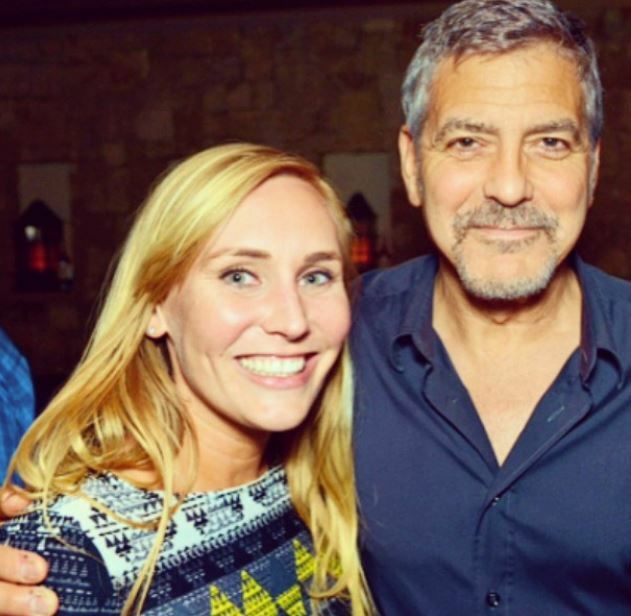 It's the story we never knew behind George Clooney's thriving tequila company, Casamigos. Clooney and pal Rande Gerber love tequila. They love it so much, the longtime friends decided to make their own: the perfect tequila -- so smooth that they could drink it just how they like it -- neat. Loosely translated, Casamigos means 'House of Friends', named after the property in Mexico that Gerber and Clooney share. Casamigos debuted in the U.S. in 2013, but it turns out the businessman and the movie star were actually "forced" into the venture. Gerber tells ET he and Clooney spent two years developing Casamigos, and then two years drinking it. But one day, they got a call from their distillery, and were informed they had been ordering a whopping 1,000 bottles of Casamigos a year. Answers were needed. "They said ... either you're selling it or you're drinking too much,'" Gerber explains, adding that he and Clooney were told they had to get licensed and "get legit" in order to keep producing their beloved tequila. Now, the venture is a burgeoning business, but its core message remains the same: friendship. Gerber's go-to toast? "To good friends." 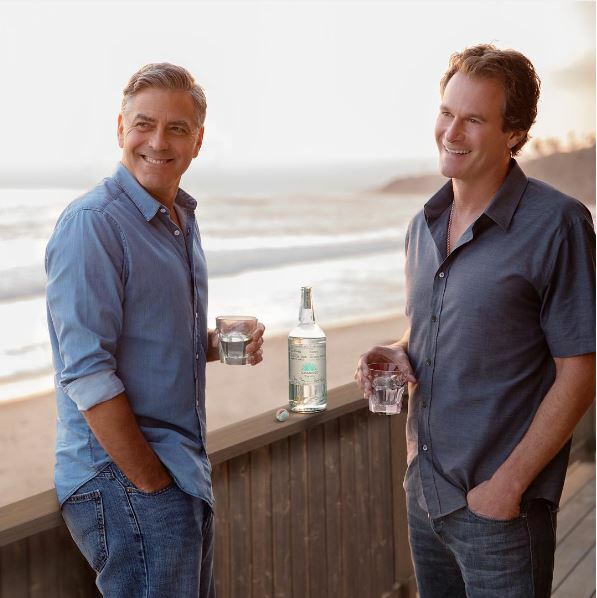 The company's new social media campaign is "House of Friends" and Gerber and Clooney want fellow tequila aficionados to share photos and videos of themselves enjoying Casamigos with their pals. "George and I made the tequila ourselves and had a lot of good times coming up with the perfect one," Gerber says. "It was made by friends, for friends and that's what we're all about: friendship." Watch the video below for how to make two amazing summer cocktails using Casamigos Tequila. That actually is an old story. It was told when they were first promoting Casamigos.